All over the world, fish are at the heart of people's diet and culture. But habitat loss and poor fisheries management have threatened many wild salmon runs. Now some companies are raising salmon in giant underwater net pens, promising more fish for people to eat and less pressure on wild salmon. Yet there are serious negative impacts from salmon aquaculture on a favorite food, our marine environment, and coastal communities. Filmed in British Columbia, Chile and the U.S., Net Loss: The Storm Over Salmon Farming provides a global perspective on this industrial approach to producing salmon. Government and industry spokesmen make the case for salmon farming, while fishermen, native people, scientists and chefs explain the dangers it may pose for the environment, human health, and coastal cultures. Featured in the film are whale biologist Alexandra Morton; Joseph McGonigle of Aqua Bounty Farms; Rodrigo Infante of Salmonchile; Seth Zuckerman, co-author of Salmon Nation; former Canadian MP Lynn Hunter; Chief Bill Cranmer, Namgis First Nation [BC]; and independent fishermen from North and South America. Net Loss: The Storm Over Salmon Farming combines lush marine photography with a lively musical score (including songs by Taj Mahal and Lila Downs). 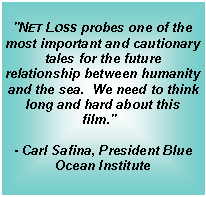 Net Loss won a Bronze Award at the Columbus International Film Festival, the Environmental Awareness Award at the International Wildlife Film Festival, and has been featured in many other festivals, including: Toronto Planet In Focus, Hazel Wolf Environmental, Wild and Scenic, Green Reel, and Santa Cruz.